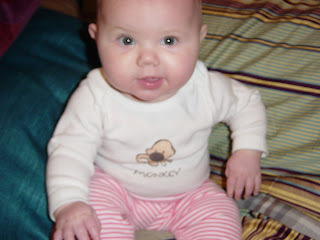 so, the story behind why we horrify our parents by calling our little girl a "monkey".....When we brought Annikah home we had every intention of NOT being one of those parents that mumble baby talk constantly and call our baby everything BUT her name. Ah, intentions....by day two every time we looked at her we would think that she looked like a little monkey (an adorable one) but her little bald head, scrunched up face screamed MONKEY! Se we gave in and began the process. I say process because the name have now evolved (pun intended)! We now float from plain monkey to the more serious "the monk" to the silly "monkey joy." I took this name one step further when, I think out of pure exhaustion (at least that is the excuse we will go with)in the early weeks I was babbling to the baby and made up a story about how Jason and I went to Lincoln Park Zoo and saw Annikah in the trees in the monkey enclosure. We then of course asked if we could take her home because she was so cute and then friendly zoo keepers obliged! So that is the story behind Monkey days. As this picture shows we think she is living up to her name by still making monkey faces now and again.